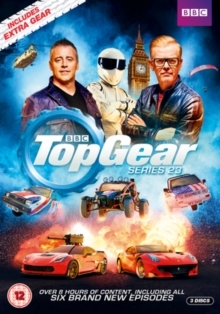 All six episodes from the 23rd series of the BBC motoring show with new presenters Chris Evans and Matt LeBlanc. Featuring the usual blend of vehicle reviews, celebrity interviews, motoring challenges and in-studio banter, this series sees the new hosts joined by fellow presenters Eddie Jordan, Chris Harris, Sabine Schmitz and Rory Reid as well as celebrities including Jesse Eisenberg, Jenson Button, Kevin Hart and Bear Grylls for the new 'Star in the Rallycross Car' segment. The new team review cars including the McLaren 675LT, Tesla Model X and Ferrari F12 TDF and undertake a number of special motoring challenges across the globe.